We have talked about visiting the Colorado Railroad Museum numerous times and have always wanted to go. It was featured on Channel 9 News a few months ago which sparked our curiosity even more. They were offering a free admission day this weekend, so we took advantage. It is located in Golden near the Coors Brewery about 15 minutes from us. We entered through the gift shop, a replica 1880’s train depot and decided on the optional “Galloping Goose” ride. After we walked through the small museum that gave a brief history of the railroad in Colorado, we made our way to the station to take our ride. As we waited, we saw the largest train they had on display, engine 5629. It weighs a mere 600,000 lbs and the driving wheels are a massive 6 feet in diameter. It is one thing seeing these in the movies and in pictures, but to see it in person was unbelievable. It was truly a steel behemoth. The goose arrived and we boarded the strange-looking car/train. These were originally mail carriers used to take mail to the small hard to get to towns in the mountains and later, some took passengers. There were only 7 of these built in the 1930’s and the museum has three of them. We took the short loop (3x) around the 15 acre property as we got a history lesson from the conductor. After riding the goose, we understood where it got its name from: it sways back and forth on the tracks quite a bit. We got off the train and walked around to see the static displays. You can go inside some of the cars and engines, but most are locked. For a fee you can pay for a guided tour and go in all of them, which we might do another time. They have the oldest engine in Colorado, which was made in 1880 and is about a quarter of the size of engine 5629. It is amazing to see the old cars made of wood with bench seats inside and then see one of the Rio Grande cars from the 50’s and 60’s, what a difference. Looking into one of the late 1800’s cars with wood seats wrapped with a red velvet material, I can just imagine women with their bustle gowns and men in top hats riding to the next town. It is like looking into a time capsule. One of the most interesting facts we learned was the difference in narrow gauge and standard gauge rails and cars. I had always heard the terms, but never really thought too much into it. 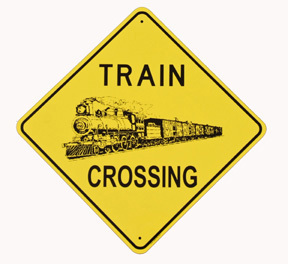 Standard gauge tracks measure 4 ft 8 in across and narrow gauge measures between 2 and 3 ft 6 in across. The most extensive and well known of the narrow gauge was the 3 ft wide rails used in the Rocky Mountains. The narrower tracks and smaller trains were developed to make it through the tight canyons and switchbacks throughout this mountainous region. One display showed the narrow gauge tracks inside the standard tracks with train cars on either side to show the difference. Another interesting display was the two examples they had for removing snow from the tracks. One went in front of the engine and it literally pushed all the snow away from the tracks. This menacing looking device was called a wedge plow and it was slanted and attached to an open car, which was then weighed down in the rear to compensate for the weight of the snow. It is about 20 ft long and about 15 feet high and is adjustable. Another snow removal device was actually part of the engine, called a rotary plow. It is a huge circular saw that cut up the snow and threw it to either side. (Click on the links below to see them in action). The Colorado Railroad museum has a lot to offer and I would like to go back in the spring to see everything and especially go inside more of the cars. It is an evolving museum, as they have a restoration building on site. They even have two large toy train sets outside. One is true steam and the other is electric. The museum is a great representation of our advances in travel and commerce, which helped shape this area in and around the Rocky Mountains. If you haven’t been, you have to check it out.